I made this for pure vegetarian friends of mine. Though I don’t have much experience in preparing Vegetarian Food, my friends loved the result. Maybe because I made the bean sprout myself, which is very easy and when you make it yourself, you are sure that they are clean. I think bean sprouts taste best when eaten fresh along side with our Pad Thai or fried noodle. For the Non-Vegetarians you can use minced pork instead of the ear mushroom in this dish. First fry the tofu that each side turn golden and set aside. 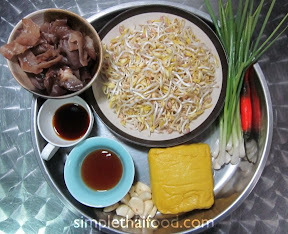 Fry the Garlic in oil, when frying add the Ear Mushroom, follow by the bean sprout. Season with Mushroom Sauce and Soya Sauce. 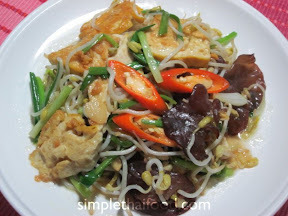 Stir well and then add the Spring Onion, Chili and the fried Tofu. Mix all well and turn off the Gas.